In Love’s Labor’s Lost, the comedy centers on four young men who fall in love against their wills. The men, one of them the king of Navarre, pledge to study for three years, avoiding all contact with women. When the Princess of France arrives on a state visit, the king insists she and her ladies camp outside the court. Even so, each young man falls in love with one of the ladies. Meanwhile, Don Armado, a Spanish soldier, falls for a servant girl, Jacquenetta. 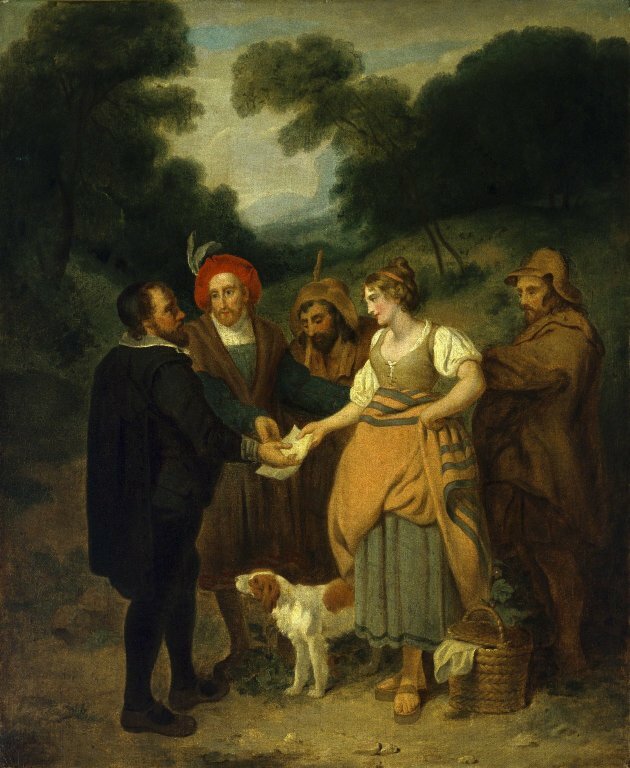 Costard, an illiterate local, mixes up two letters he is to deliver, one from Armado to Jacquenetta and the other from Berowne, one of the king's companions, to Rosaline, one of the French ladies. The men confess they are in love, and devise a pageant for the ladies, who set a trap for them by exchanging identifying markers. 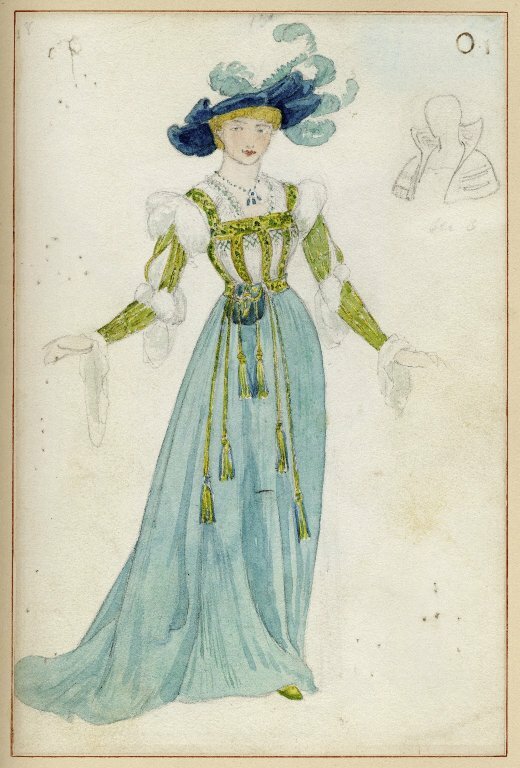 When word comes that the princess's father is dead, the ladies reject the men’s proposals as rash and impose a year's delay before any further wooing. 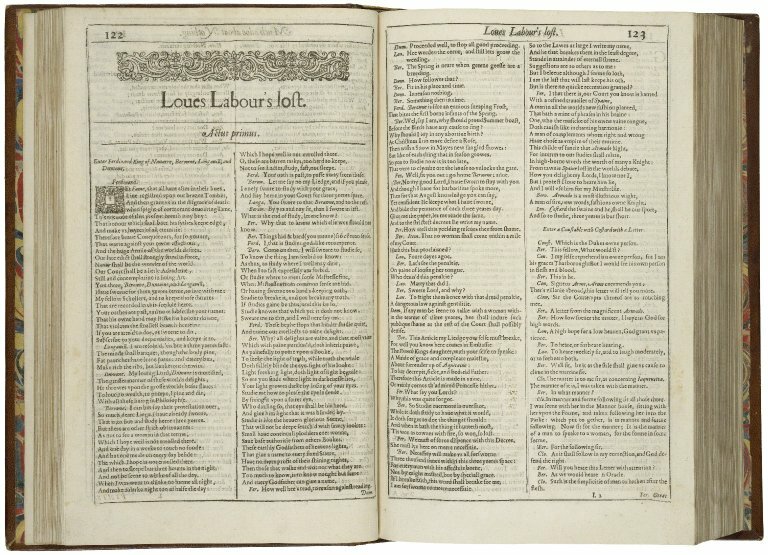 The earliest surviving edition of Love's Labor's Lost is a quarto published in 1598 (Q1). Scholars, however, suspect there might have been an earlier printing, now lost, based in part on Q1's claim on the title page that it has been "newly corrected and augmented." 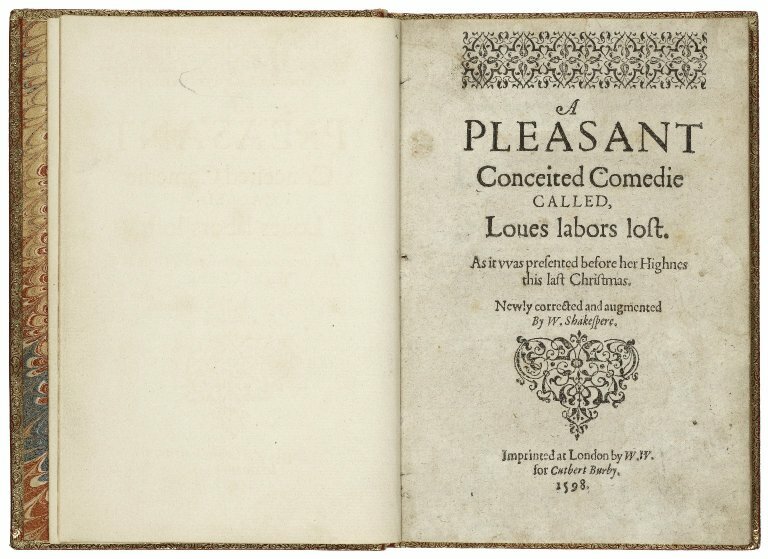 The play was not reprinted until its appearence in the 1623 First Folio (F1). F1 differs from Q1 in a number of regards, but there is no consensus on the relationship between Q1 and F1 or the hypothetical Q0. 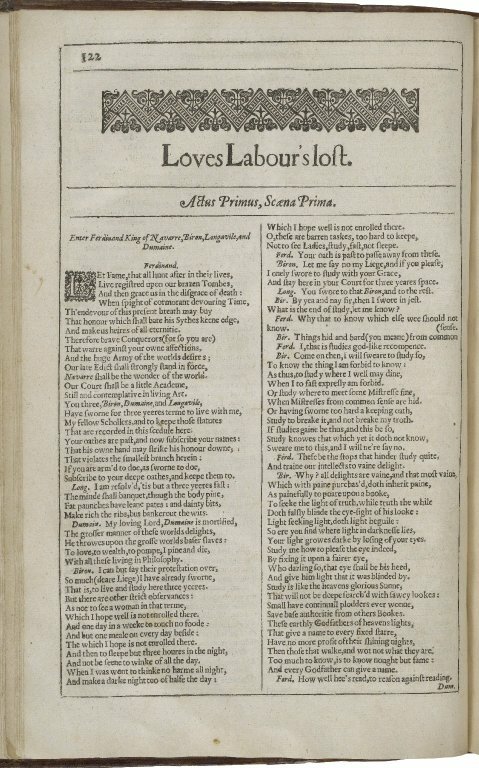 Modern editors often base their texts on F1, although the Folger edition chooses Q1 as its base text. 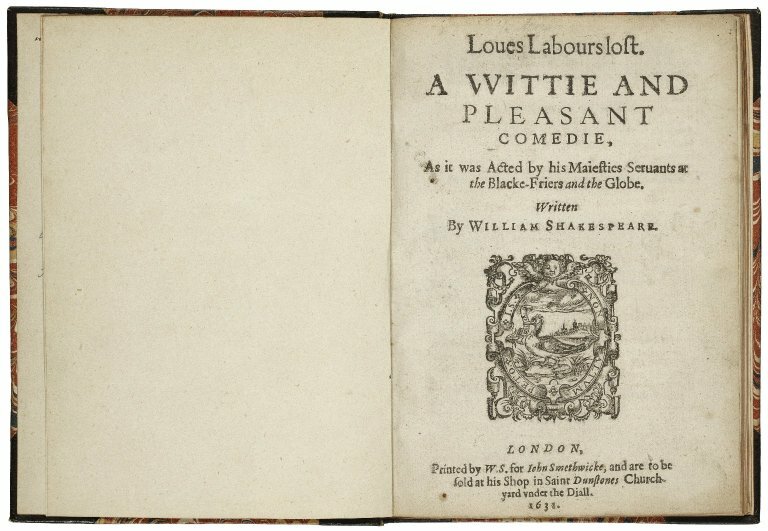 [Love’s labour’s lost] A pleasant conceited comedie called, Loues labors lost. [Love’s labour’s lost] Loues labours lost. A vvittie and pleasant comedie, as it was acted by his Maiesties Seruants at the Blacke-Friers and the Globe. 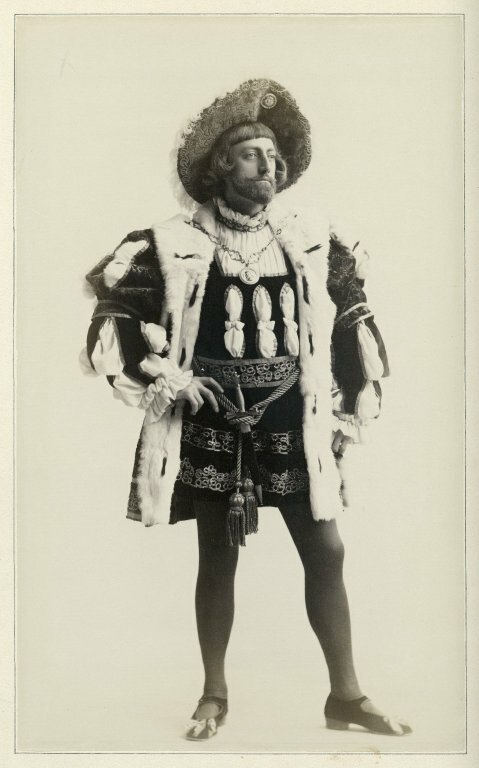 As part of an NEH-funded project, the Folger digitized thousands of 18th-, 19th-, and early 20th-century images representing Shakespeare’s plays. Some of these images show actors in character, while others show the plays as if they were real-life events—telling the difference isn't always easy. 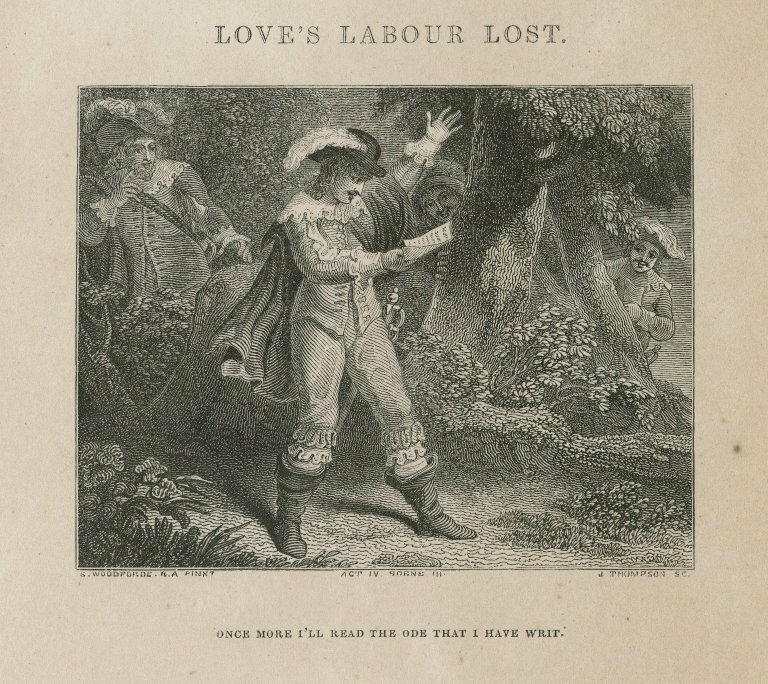 A selection of images related to Love's Labor's Lost is shown below, with links to our digital image collection. Love's labour lost, act IV, scene III: Once more I'll read the ode that I have writ ... [graphic] / Woodforde pinxt. ; J. Thompson sc.